Kevin is originally from Villa Nueva, Guatemala and is 21 years old. 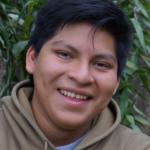 As a GOJoven Guatemala Fellow, he helps to facilitate different training processes. He has experience in human rights issues, conflict resolution and leadership. At age 12, he began getting involved with issues of leadership, community advocacy, conflict resolution and training in community arts. He is a facilitator and community advocate trained from LIJOCA methodologies (Young Leadership Changing the Game). Currently, he working to improve education through adoption of new teaching and learning tools.